We Buy Phoenix Houses!Sell Your House Fast.We Buy Houses In Any Condition - Price Range ? 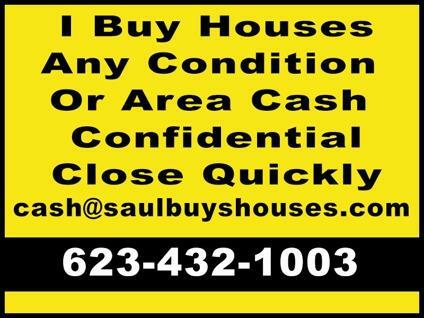 Or Location In The Phoenix Area?Need to sell your house fast in Phoenix and surrounding areas? we?d like to make you a fair all-cash offer. And we?ll even GUARANTEE that offer and can have a check in your hand in as little as 5 days.We buy houses in any condition? as-is? let us take over the burden of that unwanted property.There are lots of situations where we can help, including? avoiding foreclosure, divorce, relocating, inherited an unwanted property, own a vacant house, upside down in your mortgage, behind on payments, owe liens, downsized and can?t sell your house, needs repairs you can?t pay for, fire damaged, bad rental tenants, and more.Basically, if you have a property and need to sell it? we?d like to make you a fair cash offer and close on it when you?re ready.